Gum disease is a highly progressive oral health disease which can lead to tooth loss when left untreated. 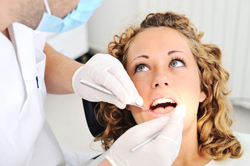 There are various stages of gum disease including gingivitis and periodontitis. As the mildest stage of periodontal disease, gingivitis makes soft tissue more susceptible to irritation, swelling, and bleeding. Generally, very little or no discomfort is present during this stage. Inadequate oral hygiene is often linked to gingivitis. Gingivitis is usually reversible with both professional treatment and a strict at home oral hygiene regimen. Risk factors for the development of gum disease include genetic factors, diabetes, tobacco use, aging, systemic diseases, stress, hormonal fluctuations, pregnancy, and use of certain medications. Untreated gingivitis can lead to progressive periodontal disease. Over time, plaque can form on all surfaces of teeth, even below gum line. Harmful bacteria in plaque produce toxins which can irritate delicate soft tissue. In attempts to fight off infection, chronic inflammatory response is activated in the body; however, this leads to destruction of connective tissue and loss of bone density. Pockets of infection can also develop with progressive gum disease, furthering the loss of soft tissue and bone, leading to inevitable tooth loss. Aggressive periodontitis usually occurs in patients who are otherwise healthy. Rapid attachment loss, bone destruction and familial aggression are come features of this type of periodontitis. This type of periodontal disease results in inflammation of the tissue supporting the teeth and progressive bone and attachment loss. It is the most frequently occurring form of periodontitis and is prevalent in adults, but can happen at any age. It is often characterized by pocket formation and gum recession. This type of periodontitis usually starts at a young age, and is associated with systematic conditions such as respiratory disease, heart disease and diabetes. It is an infection that is characterized by necrosis of periodontal ligament, gingival tissue and alveolar bone. It is mostly observed in individuals with systematic conditions such as malnutrition, immunosuppression and HIV infection. Contact our Los Angeles periodontist for more information about the types of gum disease and available treatments.